Kierra Coles, 27, has not been seen in two weeks. The U.S. Postal Service is now getting involved in the search effort for one of their own. 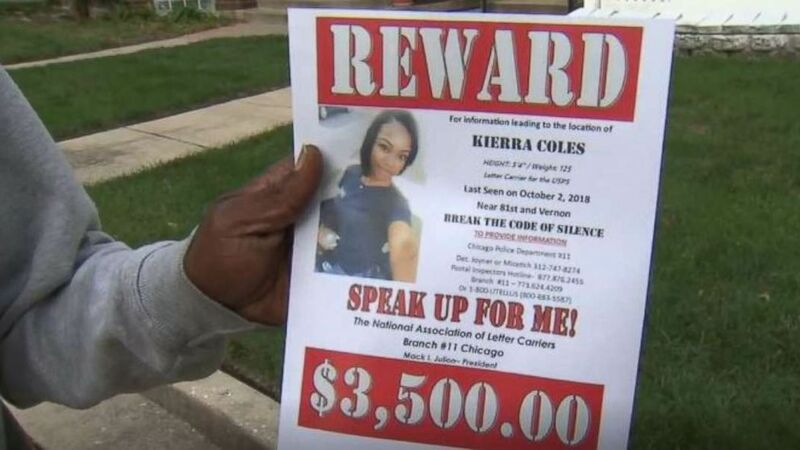 (WLS) Kierra Coles' father is passing out flyers hoping to find his missing daughter in Chicago. She hasn't been seen since Tuesday, Oct. 2, 2018. The postal worker was last seen on surveillance video from outside her apartment in Chicago's South Side on Oct. 2. Police said she called out of work that morning saying she was sick, but was seen on the video wearing her uniform and her car was found outside her apartment. Coles' mother, Karen Phillips, said it's possible she became overwhelmed by everything that was going on in her life. Phillips told Chicago ABC station WLS her daughter recently moved out of her home and into the apartment. "Maybe something did happen where she was overcome with a lot, you know when you are pregnant you are emotional," she said. "I want to say she just went somewhere and didn't want to tell nobody and then she will just come home but I don't feel that." 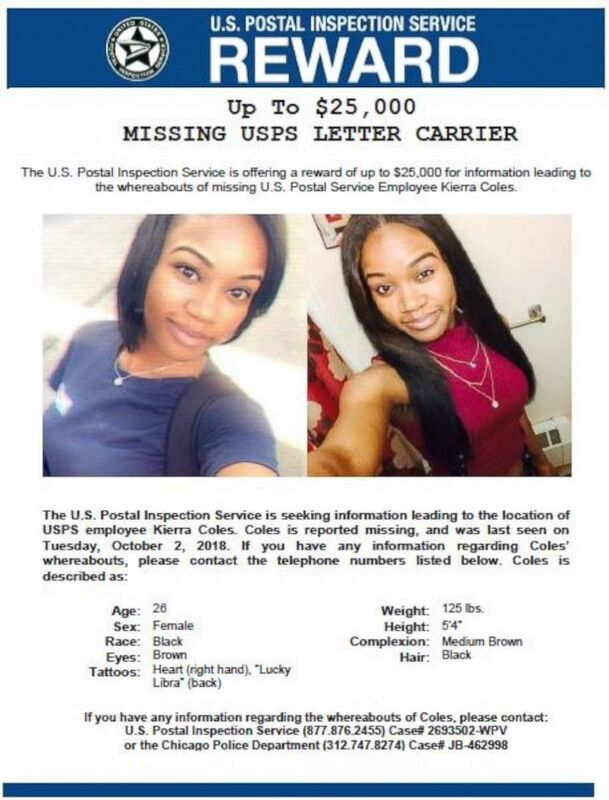 (USPS Inspectors Unit) A missing person's poster for Kierra Coles, who has not been seen in Chicago since Oct. 2, 2018. The $25,000 offered by the USPS Inspection Unit is in addition to $3,500 offered by her postal union, WLS reported. "Whoever it might be knows something," her father Joseph Coles told WLS. Joseph lives in Wisconsin, but has been in town for two weeks handing out flyers and said he "would not leave" before finding her. "We're not going to sit idly by and we're not going to rest until we find our sister," Mack Julian, from the Letter Carrier's Union, said.